Megan Hayes-Golding – Page 2 – Still learning. What’s your favorite, probably under-appreciated teacher advice? Hole punch every paper you give students. Copying a quiz? A class assignment? Whatever it is, put holes in it for their 3 ring binders before you hand it to the kids. Their organization will be miles better. What’s yours? Put ’em in the comments. I led a workshop for students to highlight moments from the (US) LGBT Movement (since 1950). Students had a chance to look at protest buttons, signs, and logos as well as read a few sentences about each. We then arranged them on a timeline and discussed them — I was fortunate to be joined by several adults & students with significant experiences with the timeline. The workshop closed with students making their own modern-day-old-fashioned-protest buttons. The 1970s section of the timeline we created during the workshop. How is it possible that as a country, we’ve achieved virtually none of these platform points from the 1979 March on Washington for Lesbian and Gay Rights? Make a copy or explore my slides or view the slides below. How did it happen that lesbians, gays, and bisexuals came to work with transgender people? The first category is about sexuality and the other is about gender. What happened to you if you told during Don’t Ask, Don’t Tell? If gays are men and lesbians are women, how come this Ellen picture says “Yep, I’m gay”? The LGBT kids who attended told me they appreciated the chance to learn their history (my main goal). The non-LGBT kids, that they had a chance to ask some questions and generally learn something new. I’m eternally grateful for the opportunity to teach those 40 students about LGBT history. My classes just wrapped up studying balance. Students built (metaphorical) models to describe their understanding of center-pivot balance as well as off-center and massed-beam balance. The project I assigned them was to build a mobile with a group of three or four members that both reflects who they are as individuals and is centered on some theme that unites them. Here are a few of my favorite mobiles. “Emoji” shown next to the mobile diagram submitted by one team member. This mobile used relatively light weights and intriguing balance points (often quite far off center) to create the most interesting looking product in class. Nice attention to detail, the end product is pleasing to the eye, and the students all could demonstrate why it balanced. “Black and White” was a unique approach because instead of tying off masses, the team used clothes pins. The mobile was infinitely adjustable and pretty much was a rock-solid construction. “Clay Figures” used a combination of materials, but especially clay, to share their interests. Fun fact about using clay to balance a mobile — as the clay dries, the balance can be thrown off as happened here. Two weeks later and most levels of the mobile are no longer balanced. Math first, building second: students draw a mobile, decide on which masses and will go where. Confirm that it should balance theoretically. Then get out the materials and build. Building first, math second: students create a balanced mobile by trial and error. Then, apply the model of balance they created earlier in the course to prove why it balances. We did option 2 and I was partially satisfied with the results. Several students reflected afterwards that they’d have preferred option 1 because they would’ve had an easier time building (that’s debatable, I think). Advice for a physics job seeker from someone who just helped to hire three — gives John’s advice to teaching candidates as someone who evaluated applicants to for his physics openings last year. Some thoughts on running a physics teacher search — how John conducted his search for physics teaching candidates last year. I’ve taught in both public and independent schools over the past fourteen years. A surprising part of my experience has been how different the hiring processes are. This post will walk you through my own recent independent school job search. I share this in the interest of explaining the process should you ever be a teaching candidate at an independent school. Let’s start where many stories do, at the beginning. In November, I first considered moving out of state but only if the job opportunity was amazing. I loved the school I was in and didn’t need to go anywhere. I updated my resume, lined up references, and contacted a search firm. I recommend having three references handy. It’s always tricky if you’re not ready to tell your current employer that you’re looking. If you’re heavily involved in #MTBoS or other online networks, consider a reference from that world. Pro-tip: Keep your resume current. Better yet, post your resume on your personal website and review it annually. Bonus pro-tip: Consider putting section at the top of your resume that says, “ask me about my favorite topics.” It’s a chance to list keywords that can start conversations. For instance, Twitter and blogging professionally are important to me and nearly every interviewer has asked me about these. If you’re on Twitter, reach out to teachers in the region(s) you’re considering. Find out the names of the schools in the area and their reputations. See if you know anyone at these schools. Use your network! From the outset though, I had to overcome some serious impostor syndrome. It’s weird, too, because on a day-to-day basis, I feel pretty good about my teaching. When I started looking around, several job postings seemed out of my league. Because I didn’t attend a prep school, it was easy to think working in one wasn’t for me. I’m here to tell you, independent schools want to hire physics teachers from a variety of backgrounds. In fact, “didn’t attend a school like ours” could be exactly what the school is looking for. For example, you stand to bring in fresh ideas, a diversity of viewpoints, and a chance to connect uniquely with students. Generally, though, they’re looking for you to have a Bachelors in physics, engineering, or a related field. If you’ve been teaching awhile, they’d like you to hold a Masters, too. I haven’t encountered any resistance that my Masters is in teaching, not science. Government teaching credentials are pretty much never required in independent schools. To recap, November was about getting my resume ready and figuring out what type of school I was looking for. In December, I began to see postings that interested me. I narrowed my interests and started talking to schools in phone interviews. The phone interview (sometimes a Skype interview) is typically about half an hour long and acts as an initial screener for the school. They’re looking to decide which finalists to bring to campus for a full interview. As a candidate, my goal in the phone interview was to get a feel for the working environment. Sometimes the phone interview will be with an individual and other times with a search committee. Often, you’ll be speaking with someone in the science department. How do teachers collaborate on planning? Does your school have a GSA (Gender and Sexuality Alliance)? What does life look like for a transgender student at your school? After I got off of my phone interviews, I realized that even the fanciest schools in the country still saw value in me — a public school educated kid from the middle class. This is a great moment to suggest to others from a similar background this: many prep schools are looking to hire a diverse faculty. If you’re wondering why a fancy school unlike anything you ever attended would even be interested in you, consider that could be exactly why they’re interested you. I was invited to campus to interview in mid-January. If your trip requires travel, the school will pick up the tab. Fact: Every great interview outfit involves a bowtie. Chances are, you’ll have at least six different appointments around campus plus be asked to teach a sample lesson. It’s not uncommon to meet with the head of school, dean of students, director of diversity, athletics director, human resources and a group of teachers in the department where you’re interviewing. Dress code pro-tip: Look up photos from the school on social media. Seek out the faculty in these photos to see how they dress. What three words would your students/colleagues use to describe you? Why are you leaving your current situation? What caused this position to open up? Tell me about the teaching philosophy in this department. What are the extracurricular expectations here? The on-campus interview is exhausting and repetitive. Interview pro-tip: Have elevator pitches ready so that you can tell similar stories all day. When the group comes together to discuss you, hopefully they’ll have some common experiences. For example, I talked about how I was looking to move because I’ve been in Atlanta all my adult life and am ready to see a new region of the country. Many schools ask prospective teachers to present a sample lesson to a group of students or other teachers. You will likely be given a topic. Sample lesson pro-tip: Ask if they can give you a recent homework assignment so that you can make sure you hit the right difficulty level. The benefit of my hands-on sample lessons is that they put the spotlight on how I interact with students over how I lecture. Even with kids I’ve just met, I’m better at relating than I am at lecturing on any topic. My interview committees have generally appreciated seeing how I relate to students over my academic chops. Something to keep in mind. Show appreciation. I take cards with me and write thank you’s on the plane ride home. Send an email thank you immediately and send the card when you arrive home. Hiring season is approximately January through March. Boarding schools like to fill their open positions early in the season and all independent schools usually like to go on spring break having made most of their job offers. Public schools, on the other hand, generally hire later in the year — usually interviewing February through May. My network was a huge help in this process. Big shout outs specifically to three people who were huge helps in my job search. Seriously, guys, thank you. Reach out to your network, both local, and online. We’re here to help you find the job that’s right for you. By the way, my search ultimately led me to small-town New England, where I couldn’t be happier. Where will your search take you? I was seriously asked last week if I had a coat because “winter is coming.” I don’t think the asker was a Game of Thrones fan, either, just concerned for my ability to survive a New England winter. Math Teachers: Raid the Physics Supply Closet! Physics teachers are just math teachers with better toys. I gave this talk at Twitter Math Camp 2017 in Atlanta. What this is: a toy car that runs at constant velocity. Pro-tip: With a fairly easy hack, you can slow them down so that you can have different constant velocities. How it’s used in physics: Sample video. When we introduce the students to constant velocity motion, we use the buggies to get them thinking about motion in terms of position and time. We’ll create graphs, data tables, and compute velocities. In my class, I like to set two teams head-to-head to predict a collision location. I provide the starting points on a number line. Pro-tip: Lay down pennies to mark the location at one second intervals. How it can be used in math: I love to have students plot the Tumble Buggy motion using Desmos — I doubt your physics teacher is using Desmos. Warning! It’s gonna be too easy to step on your physics teacher’s toes with these — if they have the buggies, they use them for the same stuff you would, too. Pro-tip: get a metronome app for your phone so that you can easily mark equal time intervals for observing motion. What this is: a piece of rope at least 3 meters long. 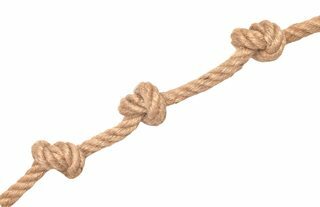 How it’s used in physics: Tie an overhand knot in the rope and measure the new length. Collect data on number of knots in rope vs. length of rope. Plot length of rope vs. number of knots. Pay particular attention to the meaning of the y-intercept and slope. How to use it in math: Please take this idea wholesale. It fits great in math class. What this is: a sonic rangefinder that works by sending out high-pitched sound to locate the distance to an object. Sampling rates are pretty high, maybe 30 Hz, so you can track moving objects. Combined with software, the motion detector can produce graphs of position vs. time, velocity vs. time, and acceleration vs. time. How it’s used in physics: Early in a course, students generally study how position, velocity, and acceleration are related. Students will sometimes perform graph matching labs where they’re given a graph and must move their own bodies in front of a motion detector to generate a matching graph. Sometimes, the motion detectors will come out again with carts that can roll down inclined planes and again with freely falling objects that fall down toward the detector. How it could be used in math: The motion detector pairs nicely with Graphing Stories. What it is: a track with grooves for carts to roll in (carts optional). How it’s used in physics: all sorts of motion labs. This is quintessential physics equipment that nearly all labs will have in the closet. In a pinch, I’ve used wood molding purchased inexpensively at a home improvement store. How you could use it in math: Get a marble or ball bearing. Release it from somewhere on the ramp and measure where it comes to rest. Repeat with a new starting point. Repeat. How it’s used in physics class: Be careful! Drop a ball so that it falls directly over the motion detector. We’ll put that data on a velocity vs. time graph. The slope of that graph acceleration (Δv/Δt). We’ll calculate the acceleration due to gravity. Some teachers might then switch to objects with significant air resistance but that’s rare. How you could use it in math: Do the same experiment — drop a ball toward the detector. This time, though, look at the position vs. time graph. The object is accelerating. You’re gonna get a nice quadratic plot. What it is: software that pulls position and time data from videos. Tracker is free. Logger Pro is a Vernier product that costs money but your school may already have a license. How it’s used in physics: Can do anything a motion detector can but without buying dedicated hardware. I like to have students film throwing a projectile. How you could use it in math: Especially if your physics teacher isn’t using video analysis, this is a fun tool for generating position vs time graphs. Shout out to Rachael Gorsuch for showing her math students exploring the focus of a parabola using a parabolic mirror. What it is: a string/rope with a weight at the end. Grab a chemistry ring stand, some string, and a mass from the physics lab. How it’s used in physics: most notably, pendulums come out when we’re heading into learning about waves. We want students to understand the idea of a period (of time) for an oscillation. Fun fact: students never really believe that the mass on the end of a simple pendulum has no effect on the period. 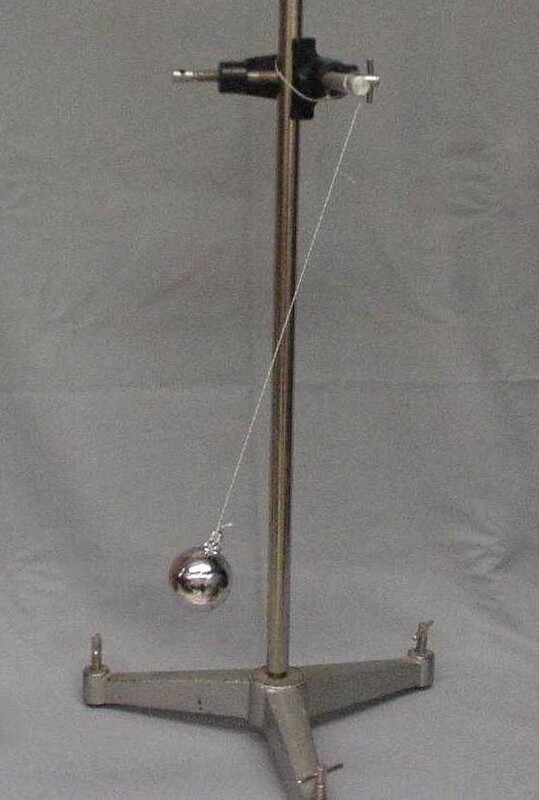 The period of a pendulum’s swing is a radical function that depends on the length of the string only. How you could use it in math: Set up a pendulum and collect data on length of string and period. Plot it. Bam! Now, I love a good function transformation, so this might be fun to play with a function stretch. 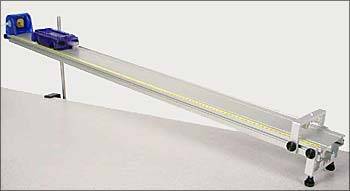 What it is: a protractor and a plum bob, often designed to attach to a track, to measure the angle of tilt. Can easily be made with a straw and protractor. I also have used a phone app (iHypsoLite is one of several). How it’s used in physics: to measure the angle of a track. How you can use it in math: Go outside and measure the height of the flagpole, height of the school, or height of the football goalpost. What it is: a set of masses that can be hung over the edge of a table, marked off with angle measurements. These strings make visible force vectors. How you could use it in math: OMG, vector addition! Dudes, just use this the same way we do in physics. Have a chat with your physics teacher that you’re not stepping on their toes by borrowing the equipment, though. Frank Noschese’s Physics Lab Modeling resources from NCTM15. PhET simulations: Most of what you’ll want for algebra is under motion and for trigonometric functions is under waves. Ooh, there is a math section though I’ve never explored it. Direct Measurement Videos: This guy (Peter Bohacek, @bohacekp) up in Minnesota put together a video library and activity guides for a host of physics concepts. The cool bit is that each contains on-screen tools for taking all necessary measurements. The physics teachers on Twitter may not be as large as the math teacher group, but we make up for it in enthusiasm. Seriously, here are some of the most helpful folks I know, regardless of content area. If you’re looking for a hands-on activity to do in math class but don’t know what lab equipment might already exist on campus, hit one of us up. Steph Reilly (@reilly1041) — was at #TMC17. Steph has taught physics and math and helped me prep this talk. She’s done many physics-y things in her math classes. John Burk (@occam98) — was at #TMC17 and is on Twitter 24/7, I suspect. John has taught math, so can understand where you’re coming from. Frank Noschese (@fnoschese) — he pretty much invented the 180 blog and his archives will give you plenty of ideas. Probably the most helpful person on Twitter, too. We tend to eschew long labs heavy on procedures (“cookie-cutter labs”) for shorter, open-ended questions (“single-sentence labs“). Be careful that you’re not using the exact idea they tend to teach, especially if you’ll be stealing their thunder. Ask if they have ideas for experiments that generate a certain type of data. We don’t really think of the content that way but can totally pull out a phenomena that will give you a nice rational function graph if you need it (I’m looking at you resistors in parallel). Good luck raiding the physics supply closet! And if you find some equipment you can’t identify, Tweet it out to me and #iteachphysics — someone will be able to tell us what it’s for. I offer up exam review and hints on my public Instagram account. A number of students have named this as my best teacher move of the year. I’ll take it — click through to see the student answers that started rolling in within an hour of posting on Sunday morning. A teacher who I had only seen passing in halls came over to the table where I was sitting during the dance and made a kind comment about my suit. That one comment may seem incredibly insignificant to other people, but it was incredibly important to me because it gave me an instant ally in the room. Check it out: Ev’s story will take you about 5 minutes to read. If you’ve ever wondered how you can support the LGBTQ students in your school, this is how. C’mon, even if you teach science like me and aren’t all in tune with feelings talk, you can do this!